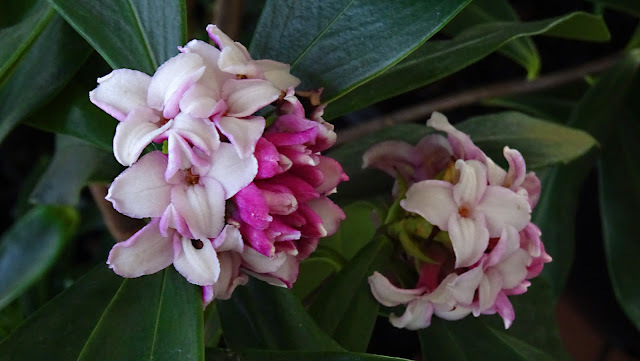 Daphne odora (winter daphne) is a species of flowering plant in the family Thymelaeaceae, native to China, Japan and Korea. It is an evergreen shrub, grown for its very fragrant, fleshy, pale-pink, tubular flowers, each with 4 spreading lobes, and for its glossy foliage. It rarely fruits, producing red berries after flowering. The Latin specific epithet odora means "fragrant". It grows best in fertile, slightly acid, peaty, well-drained soils. It grows in full sun or partial shade, and is hardy to −10 °C, possibly lower. In Korea, the plant is also poetically called "churihyang" - a thousand mile scent - referring to the fragrance of the foliage. In Japan, the plant is more commonly known as "jinchoge". Plants are not long lived, senescing within 8 to 10 years. Daphne generally do not react well to root disturbance, and may transplant badly. D. odora is also susceptible to virus infection, which causes leaf mottling. All parts of the plant are poisonous to humans and a range of domestic animals and some people experience dermatitis from contact with the sap. Daphne odora is propagated by semi-ripe cuttings in summer. A pretty plant but I could never have one here due to my cat and the skin irritation possibility. My skin can be sensitive so I try not to push its luck. Pretty flowers! I love plants and flowers and my cat does too... I can't have any flower and plant at home, otherwise my cat eats them! Beautiful flowers, that I don't think I know...but it would be great to have these in the garden because of their beauty, fragrance, and berries afterward! Gorgeous pic of a lovely flower! These fragrant flowers are commonly seen where we live in spring. They are beautiful. I love Daphne. I had a big one that died and am ready to replace it with a young one. They bloom in very early spring in Seattle, around February. I didn't see this flower before, it looks very cute! New flower for me. Thanks for sharing. So beautiful and it's a new flower for me! Now I'm curious about the fragrance... Thanks for sharing! Beautiful Nick! Have a good start!